Under the old currency of pounds, shillings and pence, the pound was made up of 240 pence (denoted by the letter d for Latin denarius and now referred to as "old pence"), with 12 pence in a shilling and 20 shillings (denoted by s for Latin solidus) in a pound. The loss of value of the currency meant that the "old" penny, with the same diameter as the US half-dollar, had become of relatively low value. The Coinage Act of 1792 had officially authorized the United States as the first English-speaking nation to have decimalised currency, although Tsar Peter the Great used the concept for the Russian ruble close to a century earlier, in 1704, while China has used such a decimal system for at least 2000 years. The United Kingdom's Parliament rejected Sir John Wrottesley's proposals to decimalise sterling in 1824, which was prompted by the introduction in 1795 of the decimal French franc. After this defeat, little practical progress towards decimalisation was made for over a century, with the exception of the two-shilling silver florin (worth 1/10 of a pound) first issued in 1849. A double florin or four-shilling piece was a further step in that direction but failed to gain acceptance and was struck only from 1887 to 1890. The Decimal Association was founded in 1841 to promote decimalisation and metrication, both causes that were boosted by a realisation of the importance of international trade following the 1851 Great Exhibition. It was as a result of the growing interest in decimalisation that the florin was issued. In their preliminary report, the Royal Commission on Decimal Coinage (1856–1857) considered the benefits and problems of decimalisation but did not draw any conclusion about the adoption of any such scheme. A final report in 1859 from the two remaining commissioners, Lord Overstone and Governor of the Bank of England John Hubbard came out against the idea, claiming it had "few merits". In 1862, the Select Committee on Weights and Measures favoured the introduction of decimalisation to accompany the introduction of metric weights and measures. The decimalisation movement even entered fiction. In Anthony Trollope's Palliser novels (and more so in the television series based on them), Plantagenet Palliser is a passionate advocate of decimalisation, a cause the other characters seem to find intensely boring. Palliser's scheme would have divided the shilling into ten (presumably revalued) pennies. This would have changed the threepence into 2 1/2 new pence, the sixpence into fivepence and the half crown into a two shilling, five pence piece. It would also have required the withdrawal and reissuance of the existing copper coinage. At the end of the fifth book in the series, The Prime Minister, Palliser (now Duke of Omnium) muses that the reform will not be accomplished, since it can only be done by a Chancellor of the Exchequer sitting in the House of Commons, and the Duke now sits in the House of Lords. The Royal Commission on Decimal Coinage (1918–1920), chaired by Lord Emmott, reported in 1920 that the only feasible scheme was to divide the pound into 1,000 mills (the pound and mill system, first proposed in 1824) but that this would be too inconvenient. A minority of four members disagreed, saying that the disruption would be worthwhile. A further three members recommended that the pound should be replaced by the Royal, consisting of 100 halfpennies (i.e. there would be 4.8 Royals to the former pound). In 1960, a report prepared jointly by the British Association for the Advancement of Science and the Association of British Chambers of Commerce, followed by the success of decimalisation in South Africa, prompted the Government to set up the Committee of the Inquiry on Decimal Currency (Halsbury Committee) in 1961, which reported in 1963. The adoption of the changes suggested in the report was announced on 1 March 1966. The Decimal Currency Board (DCB) was created to manage the transition, although the plans were not approved by Parliament until the Decimal Currency Act in May 1969. Former Greater London Council leader Bill Fiske was named as the Chairman of the Decimal Currency Board. Consideration was given to introducing a new major unit of currency worth ten shillings in the old currency: suggested names included the new pound, the royal and the noble. This would have resulted in the "decimal penny" being worth only slightly more than the old penny (this approach was adopted, for example, when South Africa, Australia and New Zealand decimalised in the 1960s, adopting respectively the South African rand, Australian dollar and New Zealand dollar equal in value to 10 shillings). But Halsbury decided, in view of the pound sterling's importance as a reserve currency, that the pound should remain unchanged. Under the new system, the pound was retained but was divided into 100 new pence, denoted by the symbol p. New coinage was issued alongside the old coins. The 5p and 10p coins were introduced in April 1968 and were the same size, composition, and value as the shilling and two shillings coins in circulation with them. In October 1969 the 50p coin was introduced, with the 10s note withdrawn on 20 November 1970. This reduced the number of new coins that had to be introduced on Decimal Day and meant that the public was already familiar with three of the six new coins. Small booklets were made available containing some or all of the new denominations. There was a substantial publicity campaign in the weeks before Decimalisation Day, including a song by Max Bygraves called "Decimalisation". The BBC broadcast a series of five-minute programmes, "Decimal Five", to which The Scaffold contributed some specially written tunes. ITV repeatedly broadcast a short drama called Granny Gets The Point, starring Doris Hare, the actress in On The Buses, where an elderly woman who does not understand the new system is taught to use it by her grandson. At 10 am on 15 February itself (and again the following week) BBC1 broadcast 'New Money Day', a 'Merry-go-Round' schools' programme in which puppet maker Peter Firmin and his small friend Muskit encountered different prices and new coins when they went to the shops. Banks received stocks of the new coins in advance and these were issued to retailers shortly before Decimalisation Day to enable them to give change immediately after the changeover. Banks were closed from 3:30 pm on Wednesday 10 February 1971 to 10:00 am on Monday 15 February, to enable all outstanding cheques and credits in the clearing system to be processed and customers' account balances to be converted from £sd to decimal. In many banks the conversion was done manually, as most bank branches were not yet computerised. February had been chosen for Decimal Day because it was the quietest time of the year for the banks, shops, and transport organisations. Many items were priced in both currencies for some time before and after. Prior to Decimal Day the double pricing was displayed as e.g. 1s (5p); from Decimal Day the order was switched to 5p (1s). For example, this order was used on most football programmes during the 1970–71 season. High denomination (10p, 20p, and 50p) stamps were issued on 17 June 1970. Post offices were issued with very simple training stamps in the same colours as the upcoming decimal stamps. Exceptions to the 15 February introduction were British Rail and London Transport, which went decimal one day early, the former urging customers, if they chose to use pennies or threepenny pieces, to pay them in multiples of 6d (2 1/2p, the lowest common multiple of the two systems). Bus companies (at that time many state-owned by the National Bus Company) were another exception, going decimal on Sunday 21 February. Decimal Day itself went smoothly. Criticisms included the small size of the new halfpenny coin and the fact that some traders had taken advantage of the transition to raise prices. Some used new pennies as sixpences in vending machines. After 15 February, shops continued to accept payment in old coins, but always issued change in new coins. The old coins were returned to the banks and in this way the bulk of them were quickly taken out of circulation. The new halfpenny, penny, and twopence coins were introduced on 15 February 1971. Within two weeks of Decimal Day, the old penny (1d) and old threepenny (3d) coins had left circulation, and old sixpences were becoming rare. On 31 August 1971, the 1d and 3d were officially withdrawn from circulation, ending the transition period. The government intended that in speech the new units would be called "new pence", but the public decided that it was clearer and quicker to pronounce the new coins as "pee". Shortenings such as "tuppence" are now rarely heard, and terms such as "tanner" (the silver sixpence), which previously designated amounts of money, are no longer used. However, some slang terms, such as "quid" and "bob", survived from pre-decimal times. Amounts denominated in guineas (21s or £1.05) are reserved for specialist transactions, such as the sale of horses and some auctions. The public information campaign over the preceding two years helped, as did the trick of getting a rough conversion of new pence into old shillings and pence by simply doubling the number of new pence and placing a solidus, or slash, between the digits: 17p multiplied by 2 = 34, – approximately equal to 3/4 ("three and four", or three shillings and four pence), with a similar process for the reverse conversion. The willingness of a young population to embrace the change also helped. In general, elderly people had more difficulty adapting and the phrase "How much is that in old money?" or even "How much is that in real money?" became associated with those who struggled with the change. (This phrase is now often used to ask for conversion between metric and imperial weights and measures.) Around the time of Decimalisation Day, "Decimal Adders" and other converters were available to help people convert between the old and new coins. The following is a table showing conversions between the decimal and pre-decimal systems. All pre-decimal coins (except for certain non-circulating coins such as crowns, sovereigns, and double florins which were explicitly excluded from demonetisation) are now no longer legal tender. Public outcry at the proposed demise of the old sixpence (6d), worth exactly 2 1/2p and originally slated for early withdrawal, postponed its withdrawal until June 1980. Shillings and florins, together with their same-sized 5p and 10p coin equivalents, co-existed in circulation as valid currency until the early 1990s. In theory this included coins dating back to 1816; in practice the oldest were dated 1947, when these coins stopped containing silver. The coins were withdrawn when smaller 5p and 10p coins were introduced in 1990 and 1992 respectively. 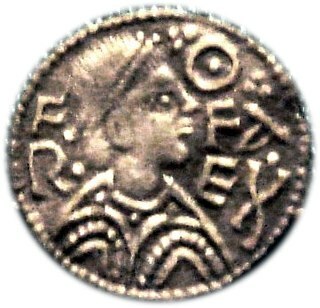 The face value of Maundy money coins was maintained, increasing all their face values by a factor of 2.4, as the coins continued to be legal tender as new pence. The numismatic value of each coin, though, greatly exceeds face value. The decimal halfpenny (1/2p), introduced in 1971, remained in circulation until 1984, by which time its value had been greatly reduced by inflation. It was not struck, except for collectors' sets, after 1983 (those dated 1984 were struck only as proofs or in Uncirculated Mint Sets) and was demonetised on 31 December 1984. The 50p piece was reduced in size in 1997, following the reduction in size of the 5p in 1990 and the 10p in 1992 (the large versions of each of the three are now demonetised). The 1p and 2p underwent a compositional change from bronze to plated steel in 1992. However, both coins remain valid back to 1971, the only circulating coins valid on Decimal Day still to be valid. In 1982, the word "new" in "new penny" or "new pence" was removed from the inscriptions on coins, to be replaced by the number of pence in the denomination (i.e. "ten pence" or "fifty pence"). This coincided with the introduction of a new 20p coin, which, from the outset, simply bore the legend "twenty pence". When the old pounds, shillings, and pence system was in operation, the United Kingdom and Ireland operated within the Sterling Area, effectively a single monetary area. The Irish pound had come into existence as a separate currency in 1927 with distinct coins and notes, but the terms of the Irish Currency Act obliged the Irish currency commissioners to redeem Irish pounds on a fixed 1:1 basis, and so day-to-day banking operations continued exactly as they had been before the creation of the Irish pound (Irish: punt Éireann). This state of affairs continued until 1979 when Irish obligations to the European Monetary System forced them to break the historic link with Sterling. In Ireland, all pre-decimal coins, except the 1s, 2s and 10s coins, were called in during the initial process between 1969 and 1972; the ten shilling coin, which, as recently issued and in any event equivalent to 50p, was permitted to remain outstanding (though due to silver content, the coin did not circulate). The 1s and 2s were recalled in 1993 and 1994 respectively. Pre-decimal Irish coins may still be redeemed at their face value equivalent in euro at the Central Bank in Dublin. Pre-decimal Irish coins and stamps' values were denoted with Irish language abbreviations (scilling ("shilling", abbreviated "s") and pingin ("penny", abbreviated "p")) rather than abbreviations derived from the Latin solidi and denarii used in other Sterling countries. Irish people and business otherwise used "£sd" just as in other countries. Thus prior to decimalisation coins were marked '1p', '3p' etc. rather '1d' and '3d' as in Britain. Low-value Irish postage stamps likewise used 'p' rather than 'd'; so a two-penny stamp was marked '2p' in Ireland rather than '2d' as in the UK. After decimalisation, while British stamps switched from 'd' to 'p', Irish stamps (but not coins) printed the number with no accompanying letter; so a stamp worth 2 new pence was marked '2p' in the UK and simply '2' in Ireland. ^ Heeffer, Albrecht (24 May 2016). "Welk land voerde als eerste het decimale stelsel voor zijn valuta in" [Which country was the first to introduce a decimal system for their currency] (in Dutch). Retrieved 30 May 2016. ^ "Preliminary report of the Decimal Coinage Commissioners". Royal Commission on Decimal Coinage, 1857. Archived from the original on 29 September 2007. ^ BOPCRIS. Final Report of the Decimal Coinage Commissioners Archived 28 April 2005 at the Wayback Machine. ^ Royal Commission on Decimal Coinage Decimal coinage Archived 12 February 2006 at the Wayback Machine. ^ "Speech by Chancellor of the Exchequer to the House of Commons 1 March 1966". Retrieved 2 June 2017. ^ "Search Results - BBC Genome". genome.ch.bbc.co.uk. Retrieved 23 November 2017. ^ "Another view" by Douglas Myall in British Philatelic Bulletin, Vol. 51, No. 5, January 2014, pp. 149–151. ^ "old-money noun - Definition, pictures, pronunciation and usage notes - Oxford Advanced Learner's Dictionary at OxfordLearnersDictionaries.com". www.oxfordlearnersdictionaries.com. Retrieved 23 November 2017. ^ "Extra's – What's that in old Money?". www.downthelane.net. Retrieved 23 November 2017. ^ "Coinage Act 1971". www.statutelaw.gov.uk. Retrieved 23 November 2017. ^ Murray-West, Rosie. "Maggie's 'brassy' pound coin prepares for 30th birthday". Daily Telegraph. Retrieved 6 March 2015. ^ "Irish Decimal Postage Stamps Issued 1970 - 1980". Moore, N. E. A. (1973). The Decimalisation of Britain's Currency. London: H.M.S.O. ISBN 0116303220. The History Files: Decimalisation in the UK. Musical satirist Tom Lehrer singing a song about plans for the decimalisation of the UK's currency on the David Frost Report. 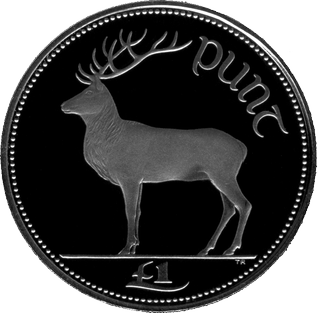 The decimal halfpenny coin was the smallest denomination of the Irish pound. It was first issued when the Irish currency was decimalised on Decimal Day, 15 February 1971. It was one of three new designs introduced all in bronze and featuring ornamental birds on the reverse. The coin value was weakened by inflation and very few were produced beyond the initial run for 1971. It was removed from circulation and demonetised on 1 January 1987.